The right hairdo is sometimes all that's needed to hide a perceived physical imperfection. Cute hairstyles can reduce the look of large noses, diminish the appearance of large foreheads and wide jaws, and help hide ears that stick out. If your ears are your problem area, there are various hairstyles you can try to minimize their appearance. Part your hair down the middle and separate it into two sections in front of your shoulders, if your hair is long enough. Starting with the right section of your hair, gather it into a low pigtail just below your right ear, and secure it with an elastic hair tie. Do the same with the left section of your hair, to create a low pigtail just below your left ear. For a variation on this style, braid each pigtail and secure with elastic at the ends of the braids. Pull your hair back into a low ponytail at the nape of your neck. When pulling it back, smooth it over your ears so that they are hidden under your hair. 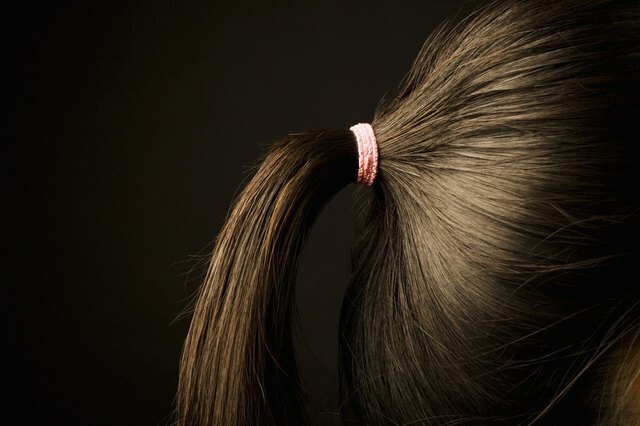 Secure your low ponytail with an elastic hair tie. For a variation on this style, once your ponytail is secured, twist it into a bun and secure the end of the tail to your head with a hair clip. Volumize your hair by curling it with a large-barreled curling iron. Start at the right side of your hair, and begin twisting 1-inch sections of hair around the barrel, curling up about three-quarters of the length. Repeat all the way around your head. By creating more volume with waves or curls, you can wear your hair down over your ears, and they will be hidden beneath the volume. Cut your hair so that it has many long layers. Layered haircuts give more volume to fine, limp hair. When worn down, such cuts can hide the ears beneath the multiple layers. 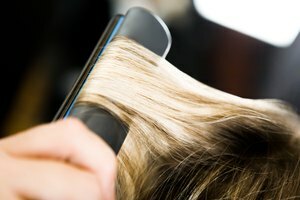 Visit a hairstylist to have your hair professionally layered, explaining that you'd like the cut to help hide your ears.